Years ago, when I first started on my successful weight loss journey, I bought myself a Pandora charm bracelet. I was high on life after being able to touch my feet again, dudes…seriously. Sometimes it’s the little things. You can check out the victory here. After a while, the Pandora bracelet ended up in the drawer and stopped taking it out again…until recently. I’m wearing it again and it is begging for a new charm. I started poking around Pandora’s website and guess what? 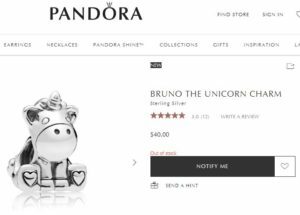 They have a freak’in unicorn charm!!!! SHUT UP AND TAKE MY MONEY!!!! I put the word out on my last Floss Tube video that I needed help setting a goal to get this charm…and I’ve decided to go with an increased step count on my new Fitbit. When I was in London two weeks ago, I was logging about 15,000 steps a day and that was really causing some pain – so I decided to take baby steps when it comes to step goals. I normally get about 4,000 steps a day, thanks to my usually sedentary job. An increase to 6,500 steps a day seems like a reasonable goal. And there we have it: 6,500 steps per day for 30 days…and the unicorn is mine!!! So…why a step goal? Because I have a theory and I want to see if I’m right. As most of you know, I’m prone to foot injuries. I usually hurt myself when I’m walking too fast, or too fast for too long. Doctors have urged me to ride a bike, swim, or do elliptical training in order to take the impact off my feet. Here’s what I think I’m missing: in keeping off my feet when it comes to the walking thing, I’m missing on the healthy-ish impact of slow…regular walking. Not walking for cardio doesn’t mean not walking AT ALL….right? There’s a process your body goes through with walking that I’m missing out on, so I am going to carefully increase my step goal and achieve that goal with slow, deliberate walking instead of the arm-pumping cardio walking that comes to mind when anyone things of fitness walking. We’ll see if that helps the horrible fatigue my feet and legs feel when I play the tourist. And then the unicorn charm will be mine!!! Well, at least it will be when it’s back in stock. Damn it! It’s out of stock!!! Until then, I’m keeping my end of the bargain. I made my step goal yesterday. Just 29 days to go, peeps. Hopefully the charm is back in stock by the time I’m ready for it. Floss Tube #3: Update from London! Floss Tube #4: The Buckingham Palace story…and something fun! Do you have a fun fitness goal? Please share it in the comments below. You might inspire someone else to live a healthier life…so why not?